We can do most iPad Mini 3 Repairs the same day. Our parts are the highest quality parts. We stand behind our iPad Mini 3 parts. If for any reason you do have issue after your repair with your iPad Mini 3, no need to worry just bring it in. 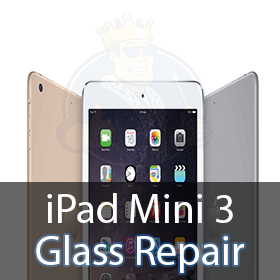 Here at King Tech Repair we have the best techs to repair your iPad Mini 3. King Tech Repair doesn’t charge you to diagnosis your iPad Mini 3. We have the fastest Repair times in NJ with same day repair service. Did you break your iPad Mini 3 today while getting out of your car? Did you crack your iPad Mini 3 today while taking your dog for a walk? Was your iPad Mini 3 screen shatter after a harsh drop on tile floor? We know exactly how you feel. We can repair you iPad Mini 3 Screen in the same day. Why wait for a refurbished phone at a higher cost and lose all of your precious data? We can repair you iPad Mini 3 Home Button in the same day. We can repair you iPad Mini 3 Charging Port in the same day. We can repair you iPad Mini 3 Battery in the same day.The Repair Kings are located right in New Jersey! We have a full staff ready to assist you with your iPad Mini 3. If you’re in a rush and can’t make an appointment no worries. Just stop in, we can get you right on your way with your iPad Mini 3 working better than ever. 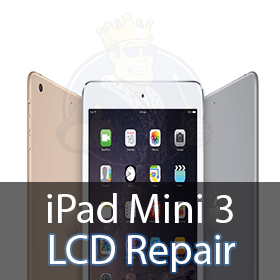 We stand behind all of our iPad Mini 3 repairs. We are located right in Lyndhurst New Jersey. We are NJ’s most trusted Repair shop for your iPad Mini 3. Stop in and see why we are the Best!